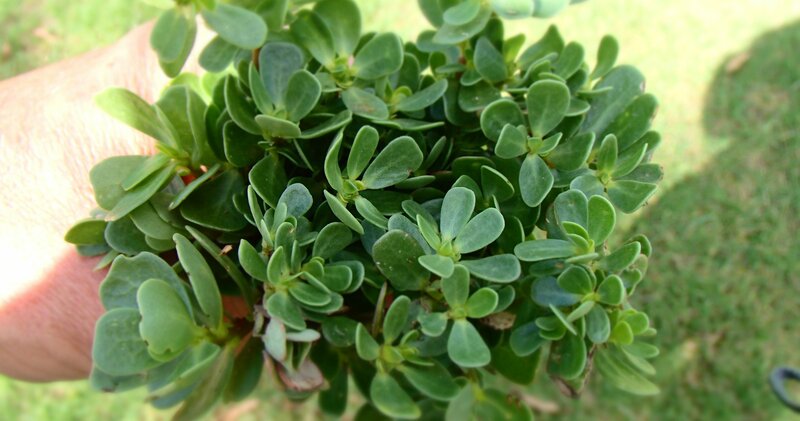 Purslane (Portulaca oleracea) is a summer ‘weed’ that is found through much of the world. Central Australian Aboriginal people used to (and a very few occasionally still do) wait for it to seed and pile it up in mounds; after some good dry desert heat, the withered plants can be pulled off to reveal a concentration of the tiny but nutritious seeds below. Throughout northern India and through to the Middle East, it is not just a foraged ‘welcome weed’ (or ‘volunteer plant’), it is even grown as a crop for its leaves (as it once was through a lot of Europe as well). Purslane is said to have the highest omega 3s of any vegetable and is a sure contender for that increasingly tedious epithet of ‘superfood’. This status, as well as being common in Central Mexican cuisine (where it is known as verdolagas) is said to be getting it increasingly on the food list rather than just the weed list in America. But across most of Australia it is simply a plant; one of those green things in the ground; neither worth eradicating nor using. It will be gone by winter after all. I gather that saag basically means ‘greens’ (in Punjabi, Urdu and/or Hindi), and by inference, in the kitchen, it is a curry thereof. There was also some volunteer native spinach (Tetragonia tetragoniodes) doing so well under the citrus that I needed to cut it back whether for eating or not. Then there was some silverbeet (chard; Beta vulgaris subsp. cicla) that was close to giving up in the summer heat and our sandy soil (in which I would probably be better to intentionally grow purslane at this time of year); and also sow thistle (Sonchus oleraceus) that is getting by as a welcome enough ‘weed’ in the shade of intentional crops. Amaranth, with each passing week of summer, is also making more of an appearance. But it is the purslane, a genuine north Indian favourite, that is the forage that started the ball rolling. The recipe is wonderfully simple and suits just about any green you can lay your hands on, foraged, grown or bought. Start by toasting the whole spices – mine were whole cumin seeds, coriander seeds and a light touch of peppercorns, fenugreek and cardamom seeds which went into the mortar with dried chillies once toasted to fragrant and then joined by powdered turmeric. You can add whatever else blows your hair back among cinnamon, cloves, ginger, fenugreek leaves, etc – only giving whole seeds the toasting though. Next, lightly sautee some onions in butter (ghee if you can) or oil and then pile the garlic, spices and chopped greens in and stir on low heat until wilted to a decent tender that should coincide with golden brown onions and garlic that isn’t burning to sticky and/or bitter (10 minutes or so), adding small amounts of liquid if required. I am also inclined to add some precooked chickpeas (kind of like canned ones but tastier because they are slow cooked in stock) – which probably makes it chana saag. The handy thing with saag, is that with some cubed cheese you have saag paneer (using actual paneer (a style of Indian cheese)) if you have it, otherwise cottage cheese, or queso fresco (or fetta if you give mind to it being salted while paneer isn’t), but in any case not your everyday fatty yellow cheese); with some cubed meat you have saag gosht; and with hard boiled egg you have anda saag. In our house of both vegetarians and ominivores, with saag we can meet our different dietary inclinations with additions at the end rather than with entirely separate dishes. 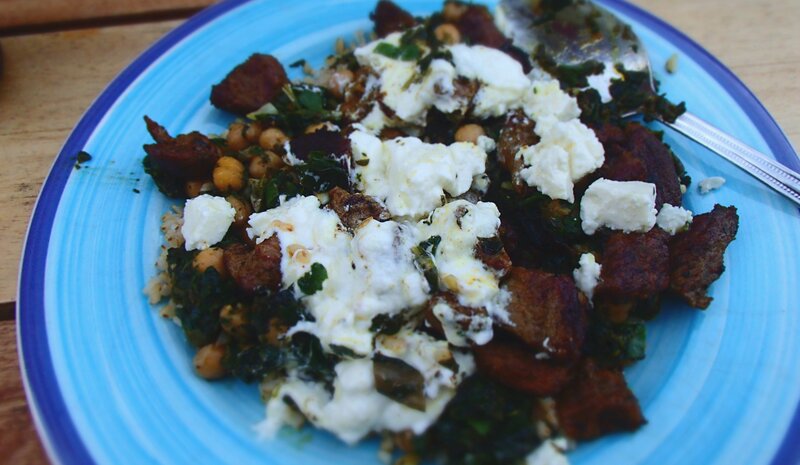 While there is something of an assumption that you would serve it over rice, the addition of the chickpeas or something else to bulk it up makes this optional. A side serve of good chutney (or salsa verde) is a good touch. You forgot the spuds, aloo 🙂 The uncanny thing is that I made a curry today and used pretty much the same spice mix. Sadly no greens here at the moment, but you reminded me I may have some frozen spinach, enough for a Saag aloo to go with the left over curry tomorrow! Saag aloo, indeed. With a kumara / sweet potato substitution for me. Thanks Eddy.